Let’s start with the basics. What’s biocontrol, and what’s IPM? In a nutshell, biocontrol is using natural enemies of plant pests–predators and parasitoids–to do the grower’s dirty work by either eating or fatally utilizing insect pests for their own gain (and to the grower’s benefit). IPM is the practice of using biocontrols coupled with other control measures such as trapping, picking, etc. IPM, or Integrated Pest Management, can also include the use of certain pesticides, but this is a gray area that involves a lot of not-so-obvious understanding. What do you call them? They’re not all insects, are they? Ladybugs, for example, are only beneficial to growers, not aphids, thus the USDA didn’t care for the blanket term. It’s a little nit-picky, but we play along. We prefer biocontrols, which is short for biological pest controls. “Natural enemies” is also another popular term and we’ll use that, too. In your website introduction, it sounds like it was the overuse of pesticides that caused the problem, similar to how the overuse of antibiotics has created resistant strains of bacteria. As you say, “In essence the chemical manufacturers shot themselves in the foot (with their own tarnished silver bullets). And growers, most notably the largely unregulated home gardeners, added greatly to the overall problem.” So home gardeners, by spraying something–anything–at the first sign of trouble, have helped create insects that are resistant to the very poisons that were once used to eradicate them? Your analogy equating the issue of insect pesticide resistance to the abuse and overuse of antibiotics is very apt. The process involved in developing resistance is very much the same. And home gardeners do contribute greatly to the problem. Homeowners spray (or hire someone to spray) more pesticides per acre per year than any other segment of the horticultural or agricultural industries, yet they derive the least actual benefit. Their reason for spraying is usually an aesthetics reflex. In other words, they want their plants or lawn to look nice, but they don’t rely on either for their day-to-day survival. A few chewed leaves or a dead patch of lawn is barely justifiable if one is trying to reduce pesticide abuse. Moreover, since gardeners don’t have the tight budgetary constraints of commercial growers, they tend to overuse and waste more. If that’s true, what’s the first thing a home gardener should do to redress these mistakes? Letting go is my first thought. Nowadays a garden is about relaxation, enjoyment, and fresh produce (if things work out). So not being a control freak and learning to live with a few pests and a little plant damage is the way to go, in my opinion. That said, it’s not that giving up completely is necessary. There are low impact solutions gardeners can turn to. They have soap, oils, bacteria (Bt), biocontrols, hand-picking, repelling, and trapping. It’s not like gardeners are powerless without toxins in their tool belt. As an aside, when I say without toxins, this includes making do without botanical pesticides like pyrethrum and rotenone as well. I figure I should mention this because a lot of people think these botanical pesticides are safe. They’re not; gardeners are just led to believe so by the marketers of these goods. The fact is, these types of products are hazardous to humans, animals, good bugs and bad, and somewhat harmful to the environment. The benefit to most of these products is that they break down quickly… if seven to fourteen days is quick. Oh, and they’re naturally-derived. Remember, though, natural does not mean safe. Just ask an all-natural rattlesnake how “safe” his venom is. Nature kills every day. I have heard that a lot of beneficial insects, when released into the home garden, fly away and don’t really help the area in which they were released. Is this true? If so, what can be done to take care of this problem? That’s often true of ladybugs, but we know this, share this information, and then account for this when determining application rates. Most releases will suffer some losses: losses in transit, losses in storage, handling losses, and losses to the wild upon release. But all of this is expected. If the requirements of the released predators or parasitoids are met — food shelter, water — most will stick around. We encourage preventive releases, when no food is around, but this isn’t a problem either since the insects won’t get discouraged and give up, nor will they fly “away.” They will just keep searching for food, ever-widening the band of effectiveness. Say a home gardener doesn’t have a bad pest problem–yet. What can a home gardener do to encourage the good bugs to rule without importing them? How can we encourage beneficial insects to make their home in our gardens? First step is to not spray poisons since doing so does not make a welcoming home for the good bugs. Next step is to accommodate them by meeting their requirements. This can done as simply as planting some wildflowers, certain flowering bedding plants, or other flowering plants, and then making sure some water is available (a little dew is all it takes). We offer a seed mix of flowering plants that provide nectar and pollen for beneficial bugs, assuring they have a balanced diet, a place to seek refuge and reproduce, and a place to feed and feel comfortable. One additional flower that we know is really good (but not in our mix) is tansy, the wildflower (Tanacetum vulgare), not to be confused with so-called tansy ragwort (Senecio jacobaea). In theory, one should be able to release one male bug and one female bug, then watch nature take its course. Is this an effective practice? Like pesticides, good bug releases need to be made every year, or whatever period is applicable to the program. It’d be nice if we were creating balance, but that’s not what we’re doing, because mother nature is too slow. We don’t create balance; we create a temporary imbalance (more good bugs than is natural) to quickly control the pests. Actual balance is attained on its own, over time, by nature. Once pests are reduced to small numbers, the predator- and/or parasitoid-populations will respond accordingly. Since new crops are planted the following year and things start over, the program usually needs to be repeated. Overwintering numbers won’t usually be enough on their own, so think of buying more bugs as getting a booster shot. 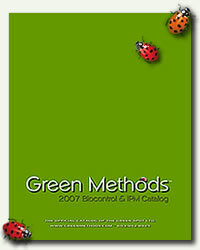 Green Methods has been in business selling biocontrol and IPM products for fifteen years. That’s a long time. I wouldn’t have thought there was much interest in such things in 1992. Who were your best customers back then? Do you find yourself serving the same types of customers as when you first started, or has your base shifted? There was already a heightened awareness of organic growing back in 1992, so we weren’t pioneers or anything. We did assume the majority of our customers would be organic growers and gardeners. We were surprised that this wasn’t the case. Most of our customers were and still are conventional growers and gardeners looking for a change. The number one reason we hear is that pesticides don’t work anymore (often the result of abuse-induced resistance). Another reason people go this route is that they want to do something positive. Call it a lack of blissful ignorance, I guess. We applaud these people. Where do you get these “bugs” from? Is their original habitat harmed by their absence? Does the process of collection harm their habitat? Regarding habitat threats, it’s not a problem. For one thing most of the critters (another good term) we carry are insectary- or lab-reared. And the wild-collected ones, like ladybugs, are done by way of a permit and it is an overseen and regulated industry. What about costs? Will growers and gardeners that take this approach be able to afford it? Quite simply, yes. We often hear that biocontrol is more expensive than conventional controls, but that’s only during the transitional phase when the end-user is learning (to scout, diagnose, act). Once the green methods are learned it tends to cost the same or less sometimes. There are also other benefits which can go into the success column, one being that the plants grown look better, greener, and are generally healthier than their toxin-treated counterparts. Mike used to publish a Green Methods Manual (and used copies are still available on Amazon), but now makes that information freely available on his website. You need to understand how biological pest control works before it will work for you, so take advantage of the research that’s already been done for you. Do you need to buy biocontrols? Your best interests will stand a better chance of being met if you focus on dealing with a distributor geared up to meet your needs and ask and answer questions â€” and there will be lots of questions, probably from both sides. From personal knowledge, I feel the best way to have a rewarding heart-to-heart experience with a distributor is in person or over the telephone. Biocontrols and IPM goods can also be purchased from Green Methods online, but you need to know what you’re doing. Hey, that was a great interview and valuable information. Thanks so much. Will use it as a reference. @Carol: We have some decent books listed. Most of which are available online. @John SMG: You might get some benefit from the use of parasitic nematodes. I applaud all of you for not being pesticide sprayers. I’m the same way in my garden. Truthfully I’d rather suffer some losses rather than spray poisons. Getting so upset about pests that one has to suit up and spray seems to me as a way to take a good-sized chunk of enjoyment out of the hobby. For the past two years I have been inundated with cucumber beetles. Not just a few but enough to completely destroy the cukes and this year the summer squash. I’m not growing cukes at all next year. I will still grow squash. We managed to get a good crop of delicatas and acorn squash despite them. I use no pesticides. I meant to add to my comment that this is a great post! I think a good post makes the readers more curious about the subject, makes them think. I don’t actively spray or actively use bio-controls, and I’ve had some plant losses because of it. This is a great subject to learn more about over the winter, when the garden is “closed” anyway. Other than the Green Methods Manual and information on his web site, does Mike have any other books he would recommend for more info? Thank you so much for this opportunity Kathy. Well done. I adore this format for information. Given my laissez-faire approach to gardening, lack of spraying poisons and planting wildflowers and such, I think I am already practicing good pest control management–and didn’t even know it! This is good information to have. Thanks for the interview Kathy and Mike. Major kudos. That was a brilliant interview, Kathy. Thanks, both to you and Mike for such an informative Q&A.